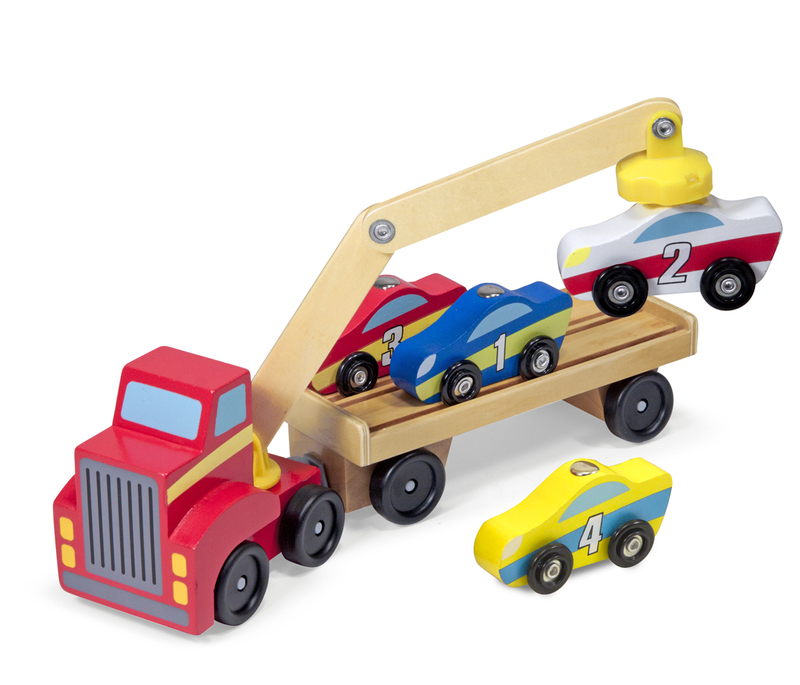 Use the crane from the Magnetic Car Loader from Melissa and Doug to lift the cars off the truck. Race the cars around and then load them back on. This is a beautiful wooden toy. Another gorgeous wooden toy – the Magnetic Car Loader from Melissa and Doug. This big red truck has a magnetic arm that can reach every car on its trailer! It’s one terrific wooden vehicle set with so much to offer: Link up the trailer to the car carrier to take the four magnet-topped cars for a drive, then unload each one at its destination. Sort and sequence the wooden cars–each one has a unique colour, stripe, and number to inspire playful counting, sorting, and sequencing activities. Then load the cars again and roll out! Car- and truck-loving kids will love discovering endless play possibilities as they roll this wooden truck toy all around the house and to the ends of their imaginations. The tough vehicles have sturdy wooden chassis and smooth-rolling wheels, so they’ll stand up to countless deliveries and road trips. And maneuvering the articulated arm is easy to do, great for fine motor skills and hand-eye coordination, and so much fun! This is a new product and I have to say that the Magnetic Car Loader from Melissa and Doug have proved that Melissa and Doug are still producing fantastic wooden toys.